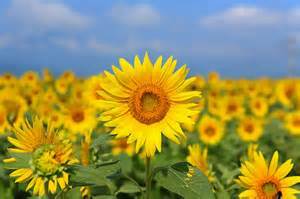 The Sunflower is probably the most amazing flowers God created. They literally follow the sun. No I don’t know about you, but one the most amazing things I have seen is a field of sunflowers. Watching one follow the sun through is cute. Watching hundreds in absolute unison follow the sun is actually quite incredible. Something I found out recently, is that Sunflowers continue tracking the suns direction long after sun set. Through 360 degree’s they ensure that they are always oriented in the direction of the sun. Their unity is totally dependant on one thing. Their relationship to the sun. Let us learn good lessen from the flower for our christian life to follow christ in all situation.